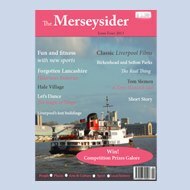 The Merseysider is an annually published magazine covering all aspects of life on Merseyside. This year, among articles on Desert Island Discs, Liverpool’s appearances in films, local events and local artists, there is also an article about The Reader Organisation! The article traces the growth of the organisation all the way from one of the earliest reading groups in 2002 and features several examples of how Get Into Reading has positively affected people. The article gives a good sense of how open and honest people are when relating texts to their personal experiences. In the article’s interview with Jane Davis, she compares the frankness of literature (in this case George Herbert’s ‘Tempers’) to the discussions which occur in Get Into Reading groups. ‘Literature is about writing down what’s going on inside human beings,’ she says. The human authenticity found in literature means that it both resonates with people and helps them to talk about the way they feel. One of the most crucial things about reading is that it lets people know they aren’t alone. Linda, a group member from Wallasey, says that she feels more diplomatic because situations now remind her of poems and short stories she’s read. It seems to become easier to understand ourselves when we realise that authors have already experienced and written down what we feel. Their honesty about the human condition makes it possible to see ourselves in their work. They also give people a language to express this with; good literature often puts difficult, even seemingly inexpressible, things into words. If you would like to read the full article, along with many more about Merseyside culture and history, you can buy the magazine from The Merseysider website as well as in local book shops and newsagents across Merseyside.